steve wrote: With carbon, I just change it when I clean out the filter. So it can be one or two months. You can prefilter the water with carbon if you want to stretch the replacement schedule. Parasites in the blood is weird, to be honest I've never heard of such a thing. Did they tell you what kind? Yes, parasites can be transmitted, but I'm not familiar with the kind your turtle has. I would be more careful with the separate tanks until this is sorted out. Sadly, one of the best ways to get a corporate response these days is through social media but it does work quite well. I appreciate the feedback. I asked to have her medical report sent to me to investigate myself, which you can see below. Redacted contact info, etc. just for privacy reasons. I'm going to reach out to the vet and the company that handled the blood work to see if I can't get more information. I tried to keep the environments pretty controlled (washing hands in between, rinsing out equipment, etc.)... I hope I haven't made a mistake. My vet told me not to worry about this, but I agree in that more investigation is probably needed. Very interesting report (I had to look up every other word) and it makes me wonder if she were wild caught or simply kept in poor conditions for long periods. steve wrote: Very interesting report (I had to look up every other word) and it makes me wonder if she were wild caught or simply kept in poor conditions for long periods. Me and you both on the "looking up every other word" part. I think biology is really fascinating, but I am no biologist. However, based on what I am reading, I am guessing she was a wild turtle in her younger days. I wonder where PetSmart gets these guys? I have attached a page from our reptile book about the parasite for you. It is a little more technical than you need, but hopefully will help. It is written By Dr. Doug Mader. He is a renowned reptile vet. The last paragraph on the page is the info about the parasite Winnie has. There is no known effective treatment, unfortunately. It would not be transmitted through the aquarium. It needs to be transmitted by a biting insect (fly, mosquito, etc) so there is a small risk for your other turtle, but I would not consider it a major health concern. Winnie’s immune system has learned to live with the parasite. I do not think it likely she will ever clear it. Having said that, there is a chance that it could improve since her environment and nutrition are so much better now. For Winnie I am not concerned. If the parasite was causing disease then she would be anemic. Her red blood cell numbers are normal so she is doing well with it. Our instinct is always to get rid of parasites, but they are not always a problem for the body. We see blood parasites fairly regularly in reptiles and most of the time we do not treat them. Hemogregarines [which includes Haemogregarina] are the most common blood protozoa of wild-caught snakes and turtles. Relatively little is known of the biology and life cycles of the reptilian hemogregarines. 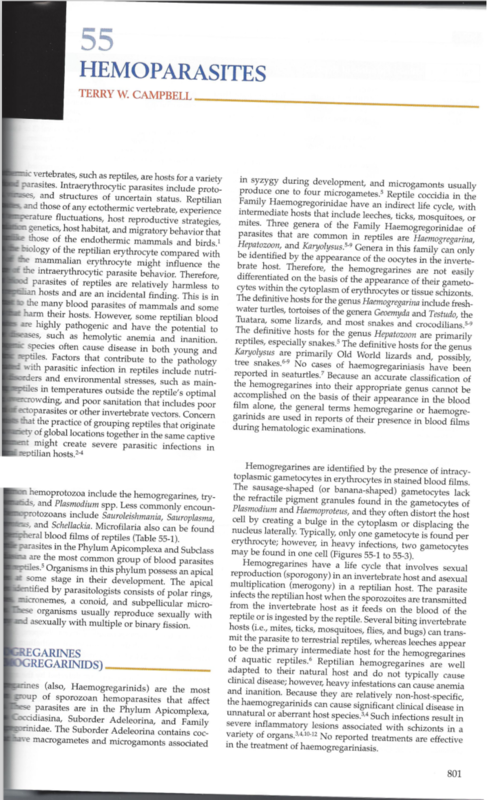 Among the best studied are the Haemogregarina spp. Haemogregarina stepanowi is found in turtles, including snapping turtles, painted turtles, red-eared slider turtles, cooters, box turtles, softshell turtles, European pond terrapins, and other turtles from the United States and Europe. Prevalence rates are often high, with 45% to 75% of animals tested found to be positive in the central and southern United States. Thanks for the links, this is pretty new and informative. steve wrote: Thanks for the links, this is pretty new and informative. Happy to be able to contribute. I'm surprised this topic has never come up on this forum before. It's pretty rare for people to post blood work, so hopefully this can be insightful for others. Has a drug called Chloroquine or Primaquine been discussed? Seems that has been used to treat hemoparasites. steve wrote: It's pretty rare for people to post blood work, so hopefully this can be insightful for others. Has a drug called Chloroquine or Primaquine been discussed? Seems that has been used to treat hemoparasites. Hmm... not that I have heard. Most places I've read - as well as my vet - say there's really no known, guaranteed cure. And that meds have only ever been used in extreme cases (as in, if the reptile's system was not able to cope with/adapt to the parasite). Seems like in those cases it was almost a matter of grasping at straws, too; although I could be wrong. I certainly hope there's a cure out there if it had to come down to it. Were the drugs you mentioned used on humans or reptiles? Looks like the first one is more general-purpose than just hemoparasites (treating malaria as well). The book I linked to a couple posts back also mentions pyrimethamine (another antimalarial drug) and doxycycline (which I think I was prescribed when I had my wisdom teeth removed... so pain killer?). Sounds like a weird hodgepodge of drugs... wonder if any of them actually do the trick. Any herpetologists frequent/formally frequent this forum? Maybe we can reach out to another professional for some insight. re: I don't think we've officially had herpetologists on this forum, though there were a few various veterinarians and biologists. The forum medium is not what it used to be. Put in a twelve hour day at work today, blegh. I'll take a look at your link though and see if I have any thoughts myself. I may have a contact or two here in Minnesota to run this topic by - I'll see what I can do over the weekend. That's too bad about the forum. I hope you never have to shut it down prematurely. Speaking of which, do you accept donations? This is such a valuable community and repository of information, even if it's a bit dormant right now. I'd be happy to contribute from a monetary standpoint (for what it's worth as a broke college student, lol). Well, I am grateful for what this community has give me, so I'll try to stick around. Regarding your article, it looks like those drugs were used on turtles to treat Haemogregarina, with little to no side effects. The issue on a whole, however, still seems largely undocumented (even your article only mentions Haemogregarina for a couple paragraphs, and then moves on). I'm guessing (if those "45-75%" statistics are true) most cases go unreported, and turtles just live symbiotically with these organisms. It's still not clear to me whether this is a "mountain out of a molehill", or if most people are just uninformed. Even my vet seemed to be pulling their stance from only one source (not to discredit them though - I'm not entirely sure). I'll try to shoot a couple of emails out today... one to a local herpetologist, and the other to the Minnesota Herpetological Society. If you have anyone on your end, feel free to try the same. If we get anything concrete, perhaps we an turn this into its own thread or a sticky or something. I'm no expert, but I highly doubt you need to worry about those parasites. Every organism has some, and at the end of the day the main thing is to keep the parasites' population under control (which it seems you're doing just fine). That being said, it's easier to do so with gut parasites than blood-based ones, but you get the idea. I'm going to wager that your turtle was WC. ASN are fairly prolific in nature, and a lot of them are crabby animals--so there's not exactly huge import pressure on them. I hope everyone has been well and is having a good time with the holidays. Just thought I'd check in and give some quick updates and pictures. Never did hear back from my contacts regarding the parasites, but Winnie's largely been doing well. Was doing more reading on female turtles, and had no idea that they all release eggs regardless of whether a male is present?? I've never owned a female, and so this was news to me. I don't know how often they do this or if they exhibit any behavioral or physiological changes before/during/after this process. Anyway, as what I saw as a step in the right direction was to build her a nesting area, which I have done (pics below). There are probably better ways to do this, but this seemed to work well enough. She hasn't been eating much the past week or so and seems a little more lethargic and bloated than usual, hence my reading on possible causes. She still doesn't really bask, but I've read these guys (erm, gals, too) aren't avid baskers, and that they're more active at night and prefer to just hide out during the day (which is pretty consistent with Winnie...). Oh, and FYI - the hangy thing in the basking area is to keep the heat somewhat contained... it rose the temps from 85 to 90F, which was what I needed it to do. Feedback and such is welcome. Females can be gravid regardless of males and the nesting instincts are there. It happens less often, if at all. There are some cases when they have overactive ovaries are constantly laying eggs, which is quite dangerous. What's the material in that container? It's just aquarium sand. She seems to like burying herself in it underwater, so I thought it'd be OK to use out of water too. Although I've heard most people use a mixture of sand and soil. Not sure how I feel about having plastic in the water... but it seems to be of reasonable quality/won't leak carcinogens, lol. If you Google "critter keeper", that's what it is. You think this is sufficient?